Who would you say was one of the most influential people in your life during your teenage years? When I joined the Los Alamitos High School team, I played for Rob Weil. Rob taught me so much about the game of softball and also so much about life. After my sophomore year he asked me to join his travel team with Tony Rico and I can say without a doubt that it was the best decision I ever made as an athlete. Both Tony and Rob continued to shape me as a player and as I grew into a leader on both my high school and travel team, I could see myself becoming the player I knew I always could be. The next thing I knew I tore my ACL at the firecracker warehouse and my dad drove me to the emergency room at 10:00 at night, where Rob met me there and told me that even if I couldn’t play for him that season that everything would still be okay. That season was super hard for me, but I learned a lot both about myself and the game. Not being able to play, I sat with Tony in the stands for some of our games and he talked to me about everything he was seeing on the field. We talked about what players were thinking, what pitch Rob or the other coach was going to call, the rhythm in players movements and what that would mean for the upcoming play. I had a lot of influential people in my life as an athlete, but Tony and Rob definitely shaped me into the player and person that I am. 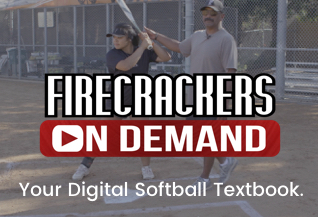 What years did you play for the Firecrackers and can you pinpoint a few key lessons you learned that helped you succeed and/or have helped you make the transition to Tennessee? I played for the Firecrackers as a junior and senior in high school, so the 2017 and 2018 seasons. During the beginning I went to the firecracker warehouse almost religiously, wanting to soak up everything I could from Tony, Mel (Melissa Roth), and the other girls. Soon enough I was integrated into part of “the crew”— the girls who ran and watched over the warehouse after school. The warehouse became my safe place, it turned into my home away from home and especially when I was hurt, being in there always made me feel better. As a part of the crew Tony taught us to always be aware of everything that was happening in the warehouse- to be lifeguards. In this way, I learned to be much more aware of my surroundings and the people in them. As a Firecracker, the biggest lessons I learned were to slow down and to play with both confidence and acceptance. If you’ve prepared to the best of your ability you can be at peace with any outcome, and then you just play the game without worrying about results. If you were to write 2-3 sentence a journal entry on Day One at the University of Tennessee, what would you have said? Day One at the University of Tennessee was both exciting and nerve racking. I was definitely nervous about having moved across the country so far away from my friends and family, but I was so excited to start my new life here. If you were to write a 2-3 sentence journal entry on your last day of Fall Classes/Practice, what would you have said? The last day of fall was definitely a very welcome sight. I missed my family like crazy and couldn’t wait to be able to go see them. It went by slow at times, but ultimately I couldn’t believe I was already half way done with my first year of college. In what area have you grown the most significantly over the past 3 months at Tennessee? In the past few months I think I have grown a lot in independence. Being so far away from home is definitely hard, so I’ve come to realize that even though my family isn’t here with me that they still are my biggest support system.